In 2008, Montefiore Medical Center and Albert Einstein College of Medicine become one of 38 academic medical centers nationally, at the time, to receive the prestigious National Institutes of Health’s Clinical and Translational Research awards. Funded through these awards, the mission of the Einstein-Montefiore Institute for Clinical and Translational Research (ICTR) is to reduce the time it takes for discoveries made in the lab today to become the future treatments for patients. ICTR also works to provide infrastructure and collaborative support on projects while enhancing the training, education and career development opportunities we provide researchers. Learn more about the Einstein-Montefiore Institute for Clinical and Translational Research. The Office of Clinical Trials (OCT) encourages and supports investigators at Montefiore and Einstein conducting clinical research by providing resources, expertise and best practices to facilitate efficient, compliant and ethical study conduct and management. OCT strives to provide exceptional support to our physicians and to our community to foster better health outcomes for our patients and afford them access to state-of-the-art therapies and drugs. The office seeks to attract novel, innovative and transformational therapeutics, diagnostics and devices to our medical center and its stakeholders, and serve as an easy partner, providing industry sponsors access to our skilled investigators, experienced study coordinators and patient community. The OCT also assists Montefiore and Einstein physicians and faculty with managing all aspects of clinical trials for new pharmaceuticals and medical devices, including both industry-sponsored and investigator-initiated studies. Learn more about the Office of Clinical Trials. Montefiore Medical Center was among three nationally-ranked academic medical centers that founded the Biomedical Research Alliance of New York (BRANY) more than 10 years ago to provide support services to sponsors and investigators involved in research in a wide variety of therapeutic areas, medical devices, biologic and diagnostic trials. Discover more about BRANY. Montefiore’s partnership with Albert Einstein College of Medicine allows our pioneering research staff to teach the next generation of research leaders through a robust educational component aimed at developing diverse, multidisciplinary clinical and translational research professionals who can fast-track the conversion of discoveries into evidence-based policies and practices that improve the health of all populations we serve. Prospective students apply directly to the PhD program or the Medical Scientist Training Program (MSTP). Once admitted to the PhD program, students complete different laboratory rotations in any of Einstein’s more than 200 biomedical research laboratories. This allows students to experience the breadth of scientific inquiry at Einstein and to identify the area of research that most intrigues them – before committing to a particular laboratory for thesis research. Learn more about the PhD program. The MSTP program is one of the nation’s oldest. The program integrates MSTP-specific courses with medical and graduate courses, during the first two years of preclinical course work. Integration continues during the PhD thesis research years through weekly involvement in the MSTP Continuity Clinic and with monthly Clinical Pathological Conferences and MSTP Career Paths Seminars. 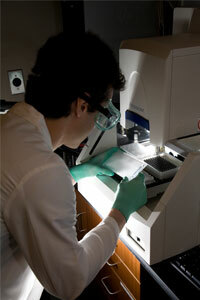 Learn more about the MSTP program.